Calvin Lamb, being interviewed by the Lubbock AJ recently. Photo by Josie Musico. One Harvey House memory that former Harvey employees and customers always seemed to share with gusto was the delicious homemade ice cream that was available every day in any Harvey House. The frozen creamy delight was made fresh daily and an individual bowl of the flavor of the day would usually only set you back fifteen or twenty cents. Often a bowl of ice cream was one of several dessert choices at the end of your seventy-five-cent dinner that also included soup, choice of entrée, two vegetables, salad, bread, and a drink. Many Harvey Houses used the “hand-crank” method of making ice cream, but that was not the case at the Slaton Harvey House. Slatonite Calvin Lamb, who was hired in 1941 as a busboy at the local Harvey House, provided this first-hand description of the inner “workings” of the popular restaurant for the book, Harvey Houses of Texas: Historic Hospitality from the Gulf Coast to the Panhandle (The History Press, 2014). Calvin explained that a truck from the nearby round house would deliver coal down a coal shoot into the Harvey House basement. “I had to bring the coal up to the kitchen to fuel the stove. Most people don’t know we cooked with coal.” And most people don’t know that a small steam-powered engine was used to crank the ice cream made fresh daily. This was another of Lamb’s duties. The steam was piped from the round house and also heated the Harvey House. After high school, Calvin worked for the Santa Fe on the line gang and then joined the Navy. He returned to work for the Santa Fe again in the train department, where he remained for forty-one years. He retired in 1987 as a conductor. 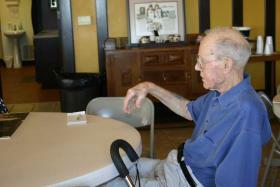 Calvin is currently a resident at the Library of Legacies assisted living facility in Idalou. Each Fred Harvey eating house made its own ice cream until the mid-1920s when ice cream plants began operations at the Harvey dairies in Temple, TX, Newton, KS, and Las Vegas, NM. Even though the Fred Harvey company made efficient use of the railroad to deliver fresh food to Harvey Houses, most patrons no longer enjoyed the delicious texture and taste that only fresh, homemade ice cream could provide. Because of the history Calvin Lamb has shared, we know that locally-made, fresh ice cream continued to be a popular item on the menu at the Slaton Harvey House until the restaurant closed in 1942.